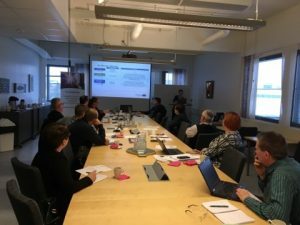 On the 13th Februar 2018 the first RENCOP workshop was held at the Regional Council of South Ostrobothnia, to launch the idea of a RENCOP working in South Ostrobothnia with potential stakeholders. Organisations active in making community energy happen as well as interested parties attended, inlcuding representatives from research and development organisations, municipalities, financiers, associations and companies, 14 people in total. New stakeholders are of course welcome. Energies of interest identified are micro-combined heat and power generation as well as biomass, biogas, solar energy and geothermal heat.